Before I turn any more maple into smoking blocks for the grill, I need advice. Has anyone else had trouble with router plate leveling screws loosening with the vibration of using the router? It’s not a gradual thing. They drop 1/16” or more with each use! I’m hoping this is just something I have done incorrectly in setup. If not, would it work to set the plate, remove it and shoot a little CA glue onto the screws? 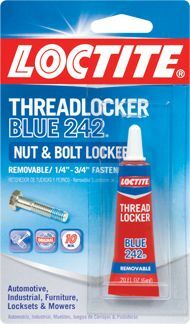 Try some Loctite before you CA glue. Red is permanent (non-removable) – Blue is temporary (removable). is it possible to get longer screws and put a jam-nut on them somehow ?? how old is your router? is it possible the threads are stripped or worn? CA glue hardens like glass – once it hardens then breaks free, it no longer does its job. Just by the way, there is super-unglue too. It is basically acetone. I only post this for the future when somebody says help! I super glued my adjustment screws and need to remove them. Re: the loctite, the only way you can remove the red is with heat. I am not aware of a solvent that breaks it down. Well, any that I would want to put on my lift. screws tight and they don’t move a bit unless I loosen the hold-downs. If the Locktite doesn’t work for you, you may want to try a wrap or two of teflon tape (the kind used on threaded plumbing fixtures). That should snug up the threads well enough. Good luck! There is an anti vibration version of thread lock available, it is orange (and removable). You might also try crushing the threads with a pair of vice grips (use needle nose and only a VERY small amount of crushing force). Don’t not crush. Especially if the female threads are aluminum. It’s asking for trouble. Other instances I might agree. Thanks for all the suggestions! As I was about to go to get thread locker, I remembered seeing a bunch of little hex nuts in the parts bag. Turns out there are as many of those as there are leveling screws, and coincidentally, they are the same size! Shazam!